For most, Friday is a day to exult the end of the work week. For five SHSU interns, however, it was a sad day, a reminder that our week in Austin was coming to an end, at least for now. I worked in Representative Zerwas’s office for the second half of the week where I was able to apply the concepts I previously learned in Senator Schwertner’s office. I was able to see some differences between the Senate and the House, but in actuality, they work in similar ways. During the week-long “internship” I was able to familiarize myself with Correspondence Management System (CMS), deal with constituent issues via telephone and mail, and even do some bill analyses. Both Senator Schwertner’s and Representative Zerwas’s staff were very friendly and helpful in teaching me how things in their office and in the Capitol function. I thought I knew the process on how a bill became a law, but there was so much more to it than I realized! There is a team of teams system behind this process. The Legislative Counsel helps with drafting the bill and the Legislative Budget Board helps assess the budget impact of the bill. And while the office staff typically initiates the bill, the staff also listen closely to constituents. Many of the ideas behind the legislation come from constituents, who alert their representatives to what is working and what isn’t. The great part to this is that everyone in each of the offices works great as a team and everyone I encountered at the Capitol was very friendly and helpful. I think that’s a huge plus when working together to accomplish the same goal. I also learned much more about how committees get their work done and what it means to be the Chair of a Committee. Representative Zerwas is Chair of the Higher Education Committee, a committee that will be meeting this Tuesday, prompting much preparation. Interested, knowledgeable, and affected parties often testify at these hearings, providing additional information that may be helpful in finalizing the bill. I was fortunate to see some of these preparations unfold. I was invited, for example, to lunch with Representative Zerwas’s staff and David Montagne, a member of the TSUS Board of Regents. It was a privilege to be able to learn from the expertise of others, and I was glad to be brought into the loop. Following lunch, we returned to the office, where I finished up working on projects I was given, and thanked the staff for the wonderful opportunity I was afforded. At the top, the tour guides offer background on the UT Tower. The tower was completed in 1937, and it continues to be one of the most recognizable buildings in the city of Austin. Paul Philippe Cret designed this building, which is two feet taller than the Austin Capitol Building. The building was originally used as an old-school library, one that utilized the card catalogue system. Approximately 25 percent of the tourists knew what a card catalogue system was, so that was explained to us, before we were freed to explore the observation deck. The wire cage enclosing the observation deck are to prevent suicides, which is a rather sobering thought. Even with the wire, however, the views are impressive! Interestingly, the tower offers a protected view of the Texas Capitol. By “protected,” I mean that the City of Austin passed an ordinance prohibiting the building of any building that obstructs views of the Capitol from the Tower. It is one of 35 or so such protected views in ATX. With a play to attend at 8, we had to hustle for dinner. Fortunately, the New World Deli (“where bland is banned”) accommodated our schedules, offering good foot, to boot. As we headed for our table at the restaurant we found a huge surprise. Our team mom, Stephanie, joined us for dinner and will join us for the rest of our weekend! We began to tell her all about our week-long internship while we waited for our food which consisted of sandwiches for everyone and salad for Megan. Even though we were stuffed at the end and were in a rush to get to Austin Playhouse, we still made room and time for dessert. We enjoyed some key lime pie and salted chocolate chip cookies which were delicious! After dinner, we headed to Austin Playhouse for the musical, A little Night Music. It was a humorously romantic musical, penned by Stephen Sondheim and Hugh Wheeler. As one of the most famous musicals, it’s plot is well familiar while also being intriguingly complex. With six main characters and as many love triangles, the play mixes humor, great music, and bittersweet romance. On top of its complex plot, the songs also offered complexity, with duets, trios, and a couple of patter songs. Although “LEAP” stands for Law, Engagement, And Politics, it could just as easily stand for Law, Engagement, Art, and Politics. This was our second musical of the last couple of months (Damn Yankees being the other), and as yesterday’s blog noted, we regularly visit art museums and even sponsor our own art program. But this was a more complex and serious piece of musical theater than we usually see, and we’re glad we had the opportunity. The music was great, the acting was fine (the Austin Playhouse uses professional actors), and the cast was excellent! It proved another late night for us, but it was a musical and fittingly bittersweet end to our “work week” in Austin. But just because our work week is over, our education continues, with trips to the Bob Bullock Museum, town parks, and other educational excursions awaiting us tomorrow. Our panoramic view of Austin and the political world continues! I’d like to thank the staff in Senator Schwertner’s office (especially Ariel Traub) and the staff in Representative Zerwas’s office for hosting me this week. Thank you! As we moved into the third day of our internships in Austin, we remained excited about heading to work in the monumental granite building that symbolizes Texas’s enduring pride–and, for us, symbolizes opportunity. There’s just something about entering the Capitol building and starting work in a legislative office. Unlike the other SHSU interns, I had a somewhat different morning planned. I met with Speaker Straus’s staff and some of their interns, and we headed to the Stephen F. Austin building that houses the oldest agency in Texas: the General Land Office (GLO). After Texas declared its independence in 1836, the GLO was created to determine “who owned what, and where.” This agency was used to end land disputes that were created during the migration to Texas after the Texas Revolution and to determine appropriate land grants to those who had served in the war. During the tour we were exposed to rare documents such as Davy Crockett’s land grant of 1,240 acres that was given to his family after the war. While reading the grant, we noticed a discrepancy in the dates. The document states: “Having served faithfully for the term of six months from the eighth day of January until the sixth day of March”(sic). But, of course, January to March isn’t six months. The discrepancy, we learned, stems from the fact that the office gave the families of those who died “more time” in Texas to ensure they earned more land. …and a land patent signed by none other than the man himself, Sam Houston! Being able to see Sam Houston’s original signature is now the peak of my Bearkat pride. In this era, the GLO manages state lands, operates the Alamo, helps Texans recovering from natural disasters, helps fund Texas public education through the Permanent School Fund, provides benefits to Texas Veterans, and manages the vast Texas coast and is the home of many original maps of Texas. After this interesting tour taking my back in Texas’s history, I, along with Kaitlyn, Megan, Karla and Beatriz had lunch at Frank and Angie’s with Eiman Siddiqui, the current Capitol Director for Representative Galindo and future chief of staff for the newly elected Representative Tom Oliverson, whose alma mater is SHSU! While we all indulged in a supreme and a veggie pizza, Eiman was able to tell us about his past experiences as an intern at the capitol, a staff member and soon he might even tell us about being a chief of staff! We received invaluable advice from Eiman on what to do and what not to do while being an intern during the legislative session. We impersonated sponges during this conversation, absorbing all the information he had to share. We all appreciated the time that Eiman took out of his day to have lunch with us, and all of the advice that he was kind enough to share in such a short time frame. And me going from Representative Hunter’s office to Senator Kolkhorst’s office. Having met her on a couple of occasions, I was looking forward to this experience. I was given a tour as part of my orientation, and it was immediately clear that Senate offices are larger. After this short introduction, I was given the office manual, a newsletter sent by Senator Kolkhorst to her constituents, a packet covering intern duties, and a 15-minute new employee video to watch. I learned more about Senator Kolkhorst, my duties, and how the office and the senate work. Also, I learned more about a hearing that takes place tomorrow, one that Senator Kolkhorst will attend! Although summer is a slow time in the legislature, I helped greet two groups of students (one elementary, one high school) who stopped by to speak with staff, became acquainted with the staff, and learned the office equipment: phones, copiers, scanners, faxes, and printers. It was an educational and productive day, one I hope lays the foundation for many more to come! After a day of getting our feet wet in the Capitol and of renewing acquaintances with LEAP Alumni, we were ready bright and early for Day Two in the Texas Legislature. Like yesterday, it was a day of learning. I am doing my learning, at least for the first half of the week, in Representative John Zerwas’s office. Zerwas represents District 28–an area with which I am familiar because I was actually raised in the district. A graduate of Baylor College of Medicine, Rep. Zerwas is an Anesthesiologist who has served in the House of Representatives since 2006. He currently serves as the Chair of the Higher Education Committee, and he is a member of the Public Health Committee. Dr. Zerwas’s chief of staff, Nelda Hunter, welcomed me and quickly assigned my duties. My project was to do research on Texas higher education admission policy and compare it to other states who have similar demographics or size. I had the unique opportunity to attend a briefing hosted by Representative Zerwas’s office. The briefing was a presentation done by a representative from Educate Texas, an advocacy council that specializes in post-secondary education in Texas. Its mission is to offer policy recommendations that improves the overall quality of higher education. This council is made up of education experts. Less glamorous but as important, I was also able learn how to use the phones and the Correspondence Management System (CMS). Although it was only two and a half days in Representative Zerwas’s office, everything I learned was truly valuable and appreciated. During my lunch “break,” Alex Galvan and I were able to meet with Erin Daly-Wilson, who works for Speaker Joe Straus. During the meeting she stressed the importance of interning and gave us tips on how to be an effective professional. I learned that the committee appointments are made within the first three weeks of session and the Speaker is elected on the first day of session by the House Members. Speaker Straus was elected in a special election in 2005 and now has three bodies of constituents: his San Antonio District, the House, and the entire state of Texas. The Speaker of the House is the 3rd most important position in the legislature only following the Governor and the Lieutenant Governor. It was great meeting with such an experienced and dedicated individual and we were grateful she carved time out of her busy day for us. Immediately following our work day we headed to Gourdough‘s, an extreme donut restaraunt, for a sweet meeting with Representative-Elect Ernest Bailes and his future chief of staff, Nick Raymond. Representative-Elect Bailes will be representing Huntsville in the State Legislature, so it was an honor to spend some time with him. As a student who would like to intern during the Session, I asked Mr. Bailes numerous questions about the qualities he looks for in an intern and took mental note of his wise words. Offices look for young people who will be reliable, professional, and skilled. After a day of (we hope) climbing the ladder of success, we decided to also climb Mount Bonnell. And after a day of building our skills, learning from others, and pursuing our dreams, we did indeed feel as though we had gotten a glimpse into a bright future. Our final day in the Valley was mostly a travel day, but we did have a chance to visit some Valley tourist attractions. …before heading to the Port Isabel Lighthouse. The Lighthouse was constructed because of heavy shipping traffic. It was completed in 1851 and has been standing for more than a century and a half, with a light that could be seen for almost 16 miles. During the Civil War, the lighthouse was used as an observation point and afterward, it continued to guide ships until it was permanently abandoned in 1905. 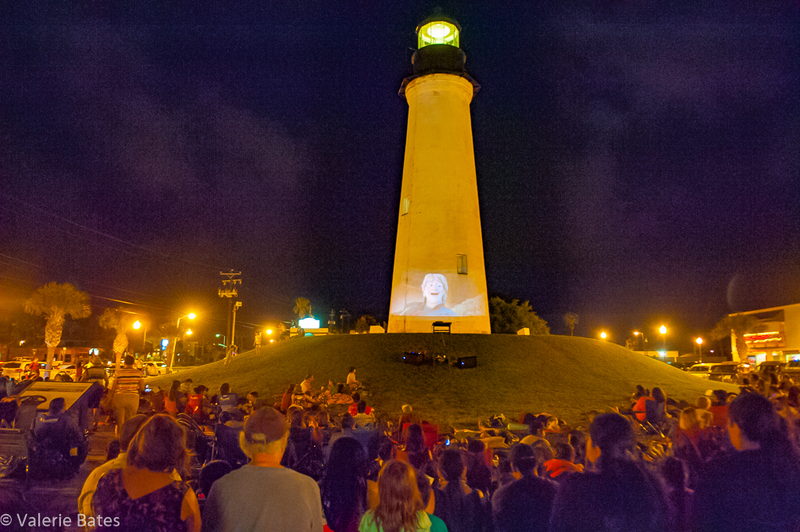 The lighthouse now serves not only as a tourist attraction, but also as a community engagement point. For the past twelve years, for example, it has hosted a cinema night, where visitors come to watch films together. The people who show up for the movie obviously have a great tolerance for humidity, which we found somewhat oppressive. It did not, however, prevent us from waiting our turn in line to get to the top. Depressingly, the people who were exiting the lighthouse would tell us, “Gosh, it feels like a sauna up there.” This was bad news, because we felt like the bottom of the lighthouse was already sauna-like. Undaunted, we made our trek up to the top, where we admired a view of an endless sea in some directions, touristy shops in other directions (Pirate Jack’s Gifts! ), refineries in still another direction, and a view of South Padre from another. It was the LEAP Center’s third trip to a lighthouse, the other two being at Tybee Island (next to Savannah) and Biloxi, MS. Although the Port Isabel lighthouse had a bit of charm, it lacked the local support, the scenery, and the amenities of the other two we had visited. And, with that, we headed back to Huntsville, where we would have less than 24 hours to prepare for our venture to Austin, Texas, for a trial internship in the state’s legislature. After a day of travel, we were ready for some substantive education about local government. Our day met our expectations, with an overview of COGs, Interlocal Agreements, Public Information Requests, Emergency Operations Center, and lots of acronyms. Professor Yawn met with Ron Garza, the Deputy Director of the Lower Rio Grande Valley Council of Government, where he learned about the process of joining a COG, the dues required, innovations in local government in the Valley, and the process for selecting board officers. For us, our day began with lunch at The Republic of the Rio Grande, a restaurant notable for its food and rich history. In November 1838 Antonio Canales argued that Mexico should re-adopt the Federalist constitution, however those who preferred a more central government rebelled and began to move into Texas. The land became known as the Republic of the Rio Grande, with Laredo being its Capitol. However, in 1840 after multiple battles and defeats, the Republic of the Rio Grande fell but lives now as a dining experience that we enjoyed. …and Alex and Beatriz tried the chicken dishes. Everyone enjoyed the wide spectrum of dishes the restaurant offered and the history that made it unique. With appetite satisfied, we set off for a meeting with Nancy Cuellar, the Emergency Management Analyst for the City of McAllen. The appointment was to learn more about the City’s 3-1-1 program and other technological adoptions by the City. But Ms. Cuellar taught us much more than one specific program. We learned about Emergency Management, grant writing, collaborating with counties, COGs, other cities, state agencies, and the federal government. I (Beatriz) was amazed at Ms. Cuellar’s knowledge and inspired by her passion. So much goes into planning, looking for solutions to problems, compromising, and using people’s ingenuity to make the Valley a better place to live. She also took us to the 3-1-1 headquarters, where we met Marco Tovias. He went into detail about the response center and demonstrated the workings of the 3-1-1 app. I was amazing at the ease with which the app worked. Snap a photo of a pesky pothole, backed-up sewage, or even a vehicle parked in the grass (a code violation!) and submit it. The issue then goes to the response center, is forwarded to the appropriate department, and help is on the way. With new technology new problems and issues arise that need to be addressed. While asking questions about the program we learned about the process of a private information request, if the program could be used for emergencies (it should not be since assistance is not available 24/7) and the most interesting to me, the legal aspects of having a 3-1-1 program. Ms. Cuellar and Mr. Tovias’ desire to make a difference was admirable and palpable in their demeanor and they were eager to inform us as citizens of their goals to make McAllen a better place through myriad programs. We then had a tour of the second story of the building where all of the emergency management staff is stationed. During the tour we learned more about the building and how grants helped make it possible. It’s obvious that Ms. Cuellar was dedicated to the City and its functions. Before leaving, Ms. Cueller even offered us to contact her if we would like to be an intern for the Emergency Management Office of McAllen! After an exciting tour we headed back to the hotel for some rare downtime. After a morning of art and aquarium life in Corpus Christi, we set out for the Valley. The night before, we went to a baseball game–Alex’s first. Tonight, we stumbled upon a bowling alley next to our hotel in Weslaco, and decided to play a couple of rounds–our first in a very long time! Beatriz Martinez, LEAP Ambassador and valley resident, joined us for the bowling game. It had been a while since any of us had bowled so we knew it would be…interesting. All of us bowled pretty well the first game, which Megan won the first game–showing exquisite form. Our second game, however, showed a marked dropoff among everyone except for Professor Yawn, who seemed energized by his loss to Chapa in game one. In fact, he thinks he bowled his best game ever. He won after posting nine strikes (! )–while the rest of us spent significant time nursing sore arms from our efforts in game one. It was a fun time filled with both embarrassing and proud moments! Happy to say all of us made at least one strike! For dinner we tried a highly recommended restaurant named Arturos. We started off with Queso Flameado with tortillas and Avocado Pico de Gallo that we enjoyed while waiting for our meals. Megan ordered Tacos de la Calle, which she said had amazing fajita meat; I ordered something that I had never tried before, Enchiladas Suizas, which were chicken enchiladas topped with tomatillo sauce and oxaca cheese. Beatriz and Professor Yawn split the Special Mexican Plate that allowed them to taste a little bit of everything. We then had Tres Leches Cake and a Caramel Crepe for dessert. With the bowling and the food, it was a sweet (and spicy!) way to begin our time in the Valley! It’s not easy to prioritize your time in a City when you have just five hours to spend, but we did a pretty good job of it. …before moving on to the Lion Fish and Electric Eels. One of the highlights was seeing the Aquarium staff in full scuba gear feeding these fish. The Museum’s exhibits are well configured, giving you the opportunity to see them up close. The jellyfish exhibit, for example, is in low light, highlighting the animals translucent tissue. The true highlight of the aquarium are the dolphins. The trainers brought out four dolphins, two of which were especially good at tricks. Through mimicry, these dolphins learn to clap, jump out of the water, do flips, swim on their back, and even splash the audience! Our favorite was a three-spin flip. Next door to the Aquarium is the city’s Art Museum of South Texas. The museum is housed in a structure designed by Philip Johnson and made from shellcrete. The current exhibit in the Museum was of Texas Mixed Media, and my favorite artist represented was Mary McCleary, who is actually a Professor of Art at Stephen F. Austin University. In her artist statement, she indicates she takes found objects and layers them onto paper in a way that “conveys an intensity which the viewer finds compelling.” That was the case for me (Alex), and I’d like to see more of her work. We also had a chance to see another Dale Chihuly, and I learned about the “Art Guys,” who have a work composed of clear glass tubes horizontally placed on the wall and filled with broken glass. Megan, too, found a new artist she liked: Bill Meek. A glass artist from Houston, his piece “Catharsis” is in a sun room overlooking a piece by Jesus Moroles outside the building. Speaking of which, the exterior of the Museum is as intriguing as the interior. The walkway to the building includes a large, ringed fountain. Off to the side is a large piece by James Surls, who graduated from Sam Houston State University. With all the art hitting close to home, we decided to stray outside the box for lunch. Thus we went to a Vietnamese Restaurant (literally called “Vietnam Restaurant”) in Corpus Christi. This seemed like an unlikely pairing, but the food was truly good. I (Megan) ordered the Vietnam Fried Rice, which was delicious; Alex had the Vermicelli Noodles with grilled chicken; and Professor Yawn had the restaurant’s signature “Hot Pot” which, after being slow cooked for 25 minutes was, indeed, hot! And very good. It was our favorite restaurant thus far in the trip. Before leaving Corpus, however, we felt somewhat compelled to visit “Mirador de la Flor,” which is a memorial to Selena, the Tejano singer. Selena was shot at the age of 23 but she sold more than a million albums in her short career and paved the way for other Hispanic singers. And with that visit, we closed down our time in Corpus Christi. Although “hooked” by the beaches, baseball, sea-life, and art, we had business in the Rio Grande Valley, so southward we roamed. But not before getting drinks at Coffee Wave. We cannot recommend this enough! The coffee was good; the Mexican Hot Chocolate was excellent, even on a summer day; and the Chai Tea Latte was amazing! And with that, we waved goodbye to Corpus Christi!